Easter is, of course, a major religious holiday for Christians, but for the secular world it’s all about candy. As it turns out, this country played a key role in the evolution of what fills today’s Easter baskets as Sandy Hausman reports. Sandy Hausman has the story. Many of the candies we like today came from Europe. Among the oldest, says author Susan Benjamin, is the so-called sugar plum. But other sweet favorites have roots in the Americas – like chocolate, first consumed as an unsweetened drink by the Aztecs. It came to Europe through Spain but would remain a treat for elites. In the colonies, however, cocoa was big business – manufactured and exported in large quantities and served to people of all income levels here. It didn’t actually become a candy until just before the Civil War, when the industrial revolution made mass production possible. In fact, Susan Benjamin says this country pioneered many sweets thanks to mechanization. And who can forget the technological miracle that is the Tootsie Roll Pop. 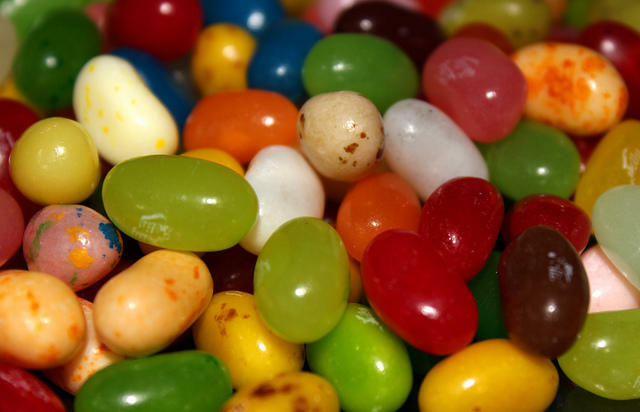 We turned Turkish delight – an old world candy – into the Easter favorite – Jelly beans. Also a product of Easter – cotton candy. Some histories trace it to the world’s fair in 1904 St. Louis, but in the mid 1700’s Americans were hand crafting spun sugar into holiday nests. The growing availability of cane sugar in the new world made this country a logical place to make candies of all kinds, but during the Second World War sugar was rationed. When the fighting ended, young men came home with a taste for candy bars that were part of their rations, and women celebrated with sweets. Children did their part in the post-war period -- becoming first-time consumers, purchasing penny candy. Susan Benjamin’s book is Sweet as Sin, and she’s the founder of True Treats – a historic candy store in Harper’s Ferry that supplies its own customers and museums nationwide.